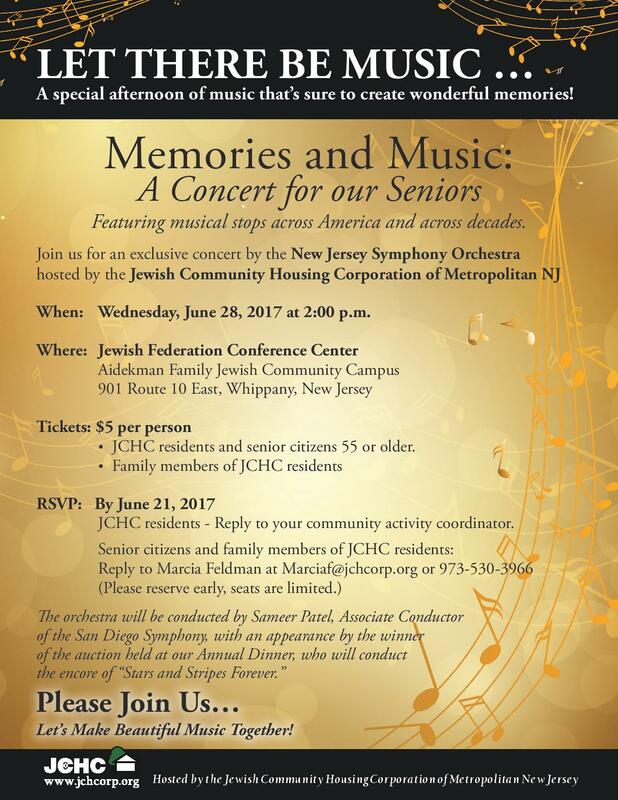 Whippany, NJ, June 14, 2017	(Newswire.com) - Older adults from throughout Morris County are invited to attend a special performance of the New Jersey Symphony Orchestra on Wednesday, June 28 at 2:00 p.m. 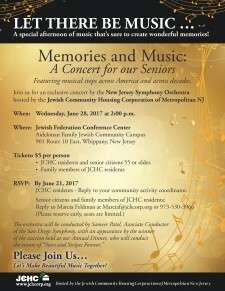 The private concert is being sponsored by the Jewish Community Housing Corporation of Metropolitan New Jersey (JCHC) and its supporters for the residents of the four senior living communities that are owned and managed by the non-profit organization. Adults ages 55+ are welcome to attend the performance at the nominal fee of just five dollars per person. The event will be held at the Jewish Federation Conference Center at the Lautenberg JCC on the Aidekman Family Jewish Community Campus, 903 Route 10 East in Whippany. Tickets to the event are available from the JCHC by emailing marciaf@jchcorp.org or calling Marcia at 973-530-3966. Corporate sponsorship opportunities are also available; for sponsorship details, please contact Harold Colton-Max, CEO, at 973-530-3961 or haroldc@jchcorp.org. 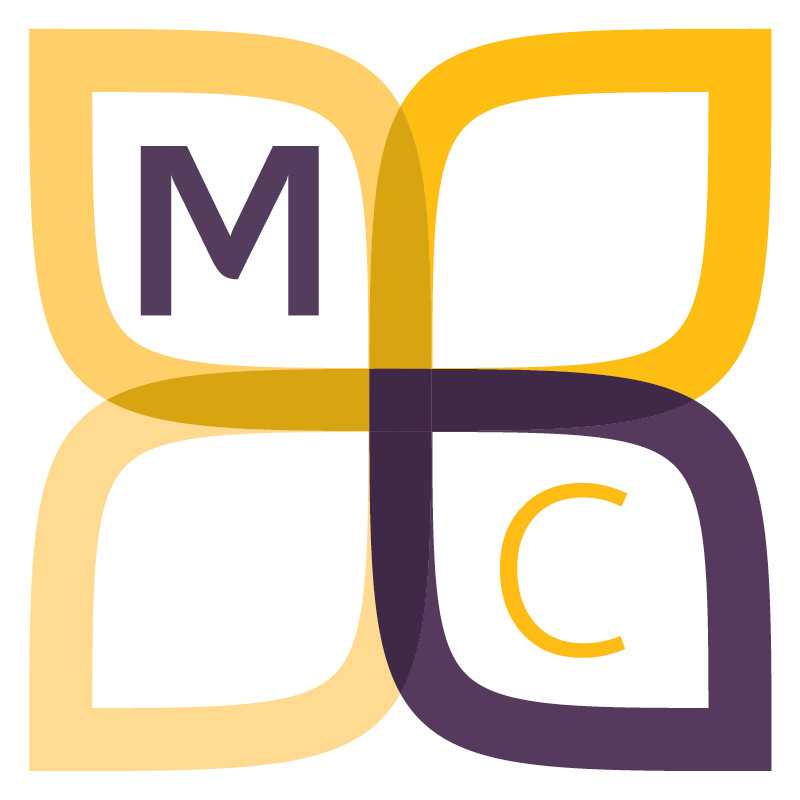 Founded in 1983, the Jewish Community Housing Corporation of Metropolitan New Jersey (JCHC) owns and manages more than 470 apartments in four buildings for older adults in Morris and Essex counties in northern New Jersey. The non-profit organization offers seniors a range of options in terms of services, amenities, location and cost, all within a traditional Jewish environment. The JCHC provides housing, programs, and services for the independent elderly as well as those who need assisted living. For more information, go to www.jchcorp.org.